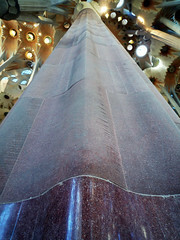 Although Antoni Gaudí was influenced by John Ruskin’s analysis of the Gothic early in his career, he sought an authentic Catalan style at a time, the late 19th century, when this region (currently mostly in northern Spain) was experiencing a resurgence of cultural and political pride. 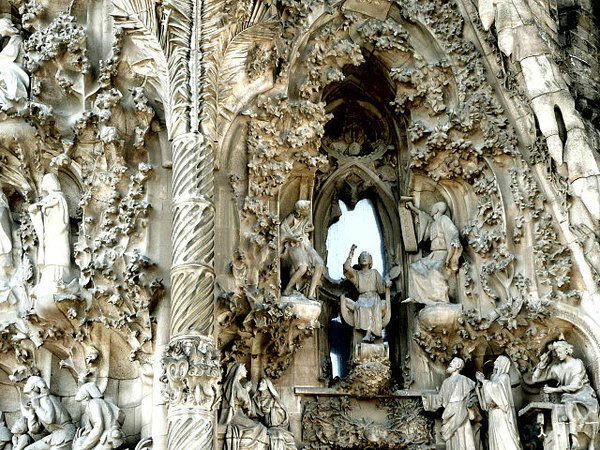 Ruskin, an English critic, rejected ancient classical forms in favor of the Gothic’s expressive, even grotesesque qualities. 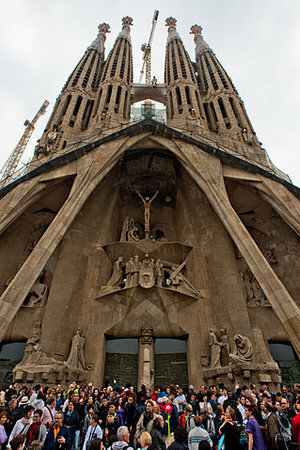 This interest in the value of medieval architecture resulted in Gaudi being put in charge of the design of Sagrada Família (Sacred Family) shortly after construction had begun. 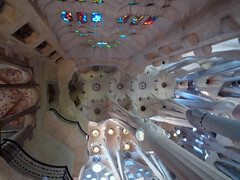 Gaudí was a deeply religious Catholic whose ecstatic and brilliantly complex fantasies of organic geometry are given concrete form throughout the church. 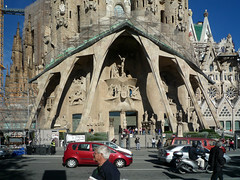 Historians have identified numerous influences especially within the northeast façade, the only part of the church he directly supervised. 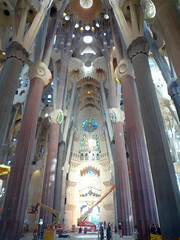 The remainder of the church, including three of the southwest transept’s four spires, are based on his design but were completed after Gaudí’s death in 1926. 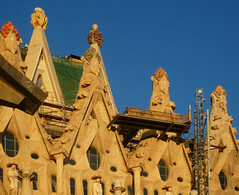 These include African mud architecture, Gothic, Expressionist, of course a variant of Art Nouveau that emphasizes marine forms. 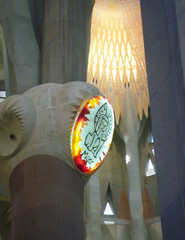 The iconographic and structural programs of the church are complex but its plan is based on the traditional basilica cruciform found in nearly all medieval cathedrals. 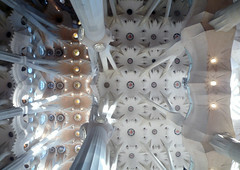 However, unlike many these churches, Sagrada Familia is not built on an east-west axis. 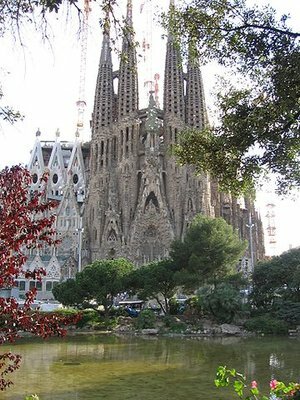 Instead, the church follows the diagonal orientation that defines so much of Barcelona, placing the church on a southeast-northwest axis. 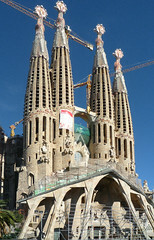 This will eventually be church’s main façade and entrance. 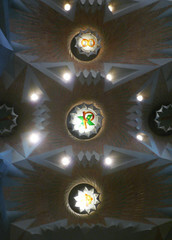 As with the transcept entrances, it holds a triple portal dedicated to charity, faith, and hope. 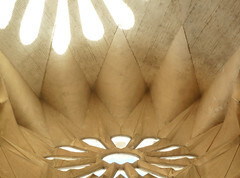 The façade itself is dedicated to mankind in relation to the divine order. 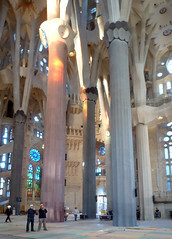 Dedicated to the Passion of Christ, its four existing belltowers are between 98 and 112 meters tall and are dedicated to the apostles James the Lesser, Bartholomew, Thomas and Philip (left to right). 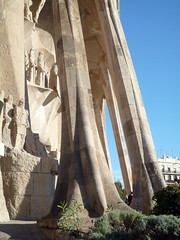 Josep Maria Subirachs is responsible for the façade sculpture. 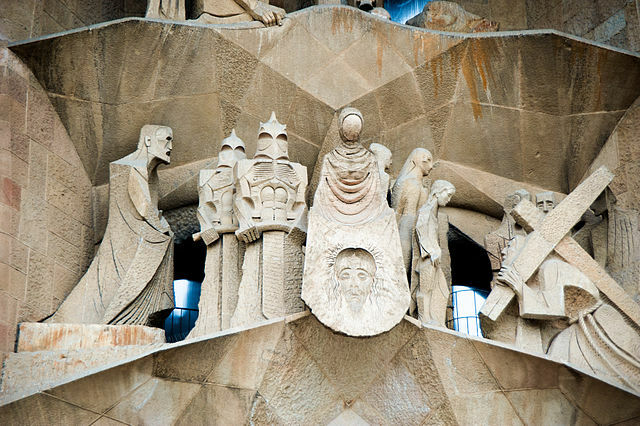 Depicts the birth of Christ and is the only façade to be completed during Gaudi’s lifetime. 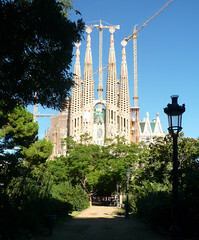 its four existing belltowers are between 98 and 112 meters tall and are dedicated to the saints Barnabas, Jude, Simon and Matthew (left to right). 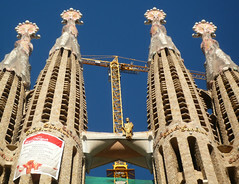 Ten additional belltowers (98-112 meters high) are planned though these will be overwhelmed by six towers that will be significantly taller. 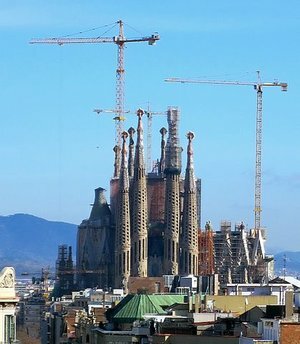 Four of these towers will be dedicated to the Evangelists, one to the Virgin Mary, and the grandest, rising to 170 meters, to Jesus Christ. 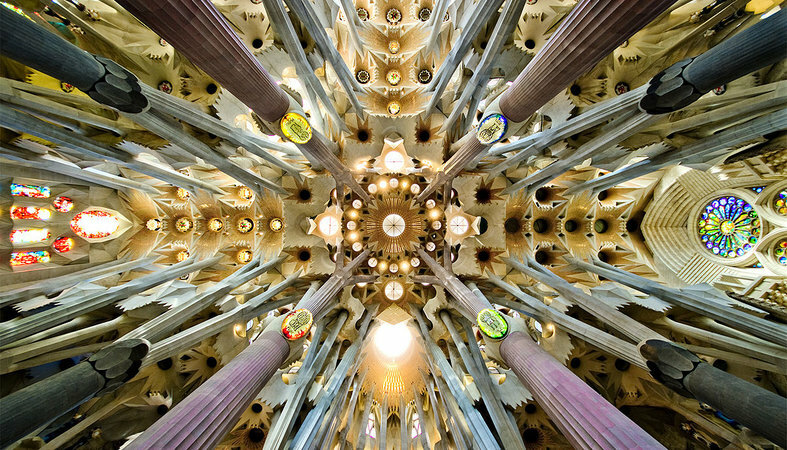 Cite this page as: Dr. Beth Harris and Dr. Steven Zucker, "Antoni Gaudí, Sagrada Família," in Smarthistory, August 9, 2015, accessed April 19, 2019, https://smarthistory.org/gaudi-sagrada-familia/.